Bachelor of Science (Hons), University of Otago, New Zealand, 1993. Dissertation: The determination of halides in a mixed halide solution. Doctor of Philosophy, University of Otago, New Zealand, 1998. Thesis: The use of diatom opal as a recorder of surface seawater free zinc ion concentration. Post-doctoral Fellow, University of Liverpool 1998-1998, United Kingdom. New Zealand Science and Technology Post-doctoral Fellow, National Institute of Water and Atmospheric Research Ltd (NIWA) 2001-2004, New Zealand. The supply and bioavailability of dissolved iron sets productivity for ~40% of the global ocean. The redox state, organic complexation and phase (dissolved versus particulate) of iron are key determinants of its bioavailability in the marine realm, although the mechanisms facilitating exchange between iron species (inorganic and organic) and phases are poorly constrained. In a recent paper published by our group we utilised the isotope fingerprint of dissolved and particulate iron to reveal distinct isotopic signatures for scavenging, photochemical reduction and biological uptake of iron during a GEOTRACES process study focused on a spring-time phytoplankton bloom. Prior to onset of the bloom, dissolved iron is isotopically light relative to particulate iron, consistent with photochemical reduction and dissolution of particulate iron in the euphotic zone. As the bloom developed, dissolved iron within the surface mixed layer became isotopically heavy, reflecting the dominance of biological removal from solution. As stable isotopes have done for major elements like nitrogen and carbon, iron isotopes offer a new window into its internal cycling thereby allowing us to disentangle a suite of concurrent biogeochemical transformations of this key bio-limiting element. Reference: Ellwood, M.J., Hutchins, D.A., Lohan, M.C., Milne, A., Nasemann, P., Nodder, S.D., Sander, S.G., Strzepek, R., Wilhelm, S.W., Boyd, P.W., (2015). 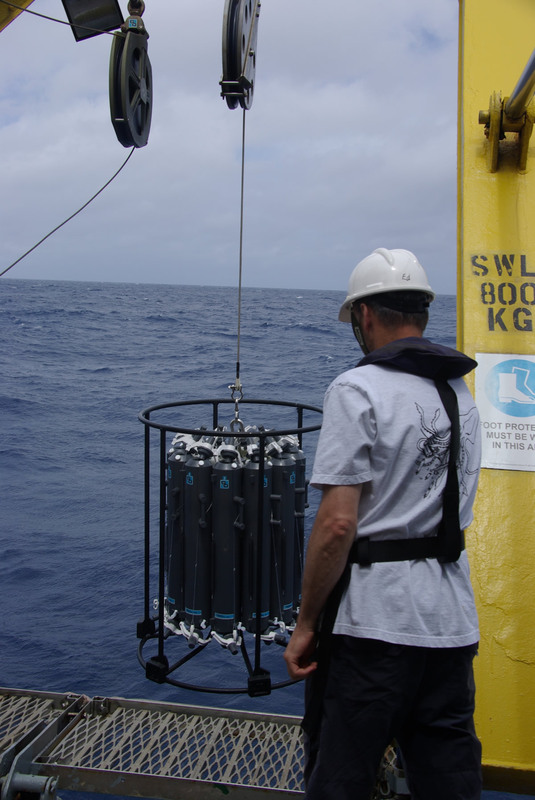 Iron stable isotopes track pelagic iron cycling during a subtropical phytoplankton bloom. Proceedings of the National Academy of Sciences, 112(1): E15-E20. Boyd, P.W., Ellwood, M.J., Tagliabue, A., Twining, B.S., (2017). Biotic and abiotic retention, recycling and remineralization of metals in the ocean. Nature Geoscience, 10(3): 167-173. Rousseau, J., Ellwood, M.J., Bostock, H., Neil, H., (2016). Estimates of late Quaternary mode and intermediate water silicic acid concentration in the Pacific Southern Ocean. Earth and Planetary Science Letters, 439: 101-108. Ellwood, M.J., Hutchins, D.A., Lohan, M.C., Milne, A., Nasemann, P., Nodder, S.D., Sander, S.G., Strzepek, R., Wilhelm, S.W., Boyd, P.W., (2015). Iron stable isotopes track pelagic iron cycling during a subtropical phytoplankton bloom. Proceedings of the National Academy of Sciences, 112(1): E15-E20. Ellwood, M.J., Nodder, S.D., King, A., Hutchins, D.A., Wilhelm, S.W., Boyd, P.W., (2014). Pelagic iron cycling during the subtropical spring bloom, east of New Zealand. Marine Chemistry, 160: 18-33. Ellwood, M.J., Law, C.S., Hall, J., Woodward, E.M.S., Strzepek, R., Kuparinen, J., Thompson, K., Pickmere, S., Sutton, P. and Boyd, P.W., (2012). Relationships between nutrient stocks and inventories and phytoplankton physiological status along an oligotrophic meridional transect in the Tasman Sea. Deep Sea Research Part I: Oceanographic Research Papers 72: 102-120. Ellwood, M.J., (2008). Wintertime trace metal (Zn, Cu, Ni, Cd, Pb and Co) and nutrient distributions in the Subantarctic Zone between 40-52 S; 155-160 E. Marine Chemistry, 112: 107-117. Ellwood, M. J., M. Kelly, W. A. Maher, and P. De Deckker (2006), Germanium incorporation into sponge spicules: Development of a proxy for reconstructing inorganic germanium and silicon concentrations in seawater, Earth and Planetary Science Letters, 243, 749-759. Ellwood, M. J., and C. M. G. van den Berg (2000), Zinc speciation in the Northeastern Atlantic Ocean, Marine Chemistry, 68(4), 295-306.